The Ancient Egyptian God with the head of a Jackal, Anubis presided over embalming and funerals here shown on a winged scarab throne. Anubis was the ancient Egyptian jackal-god of the Underworld and mummification. Anubis was worshipped as the inventor of embalming and the one who embalmed the dead Osiris, thereby helping to preserve him that he might live again. 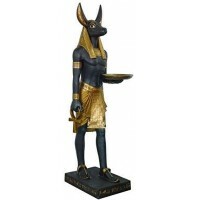 This Egyptian statue of Anubis makes a great altar piece or collectible for any lover of Ancient Egypt. Anubis holds an ankh in one hand, a staff in the other. Anubis on Throne statue measures 10 3/5 inches tall, 5 5/7 inches wide, and 5 5/7 inches deep, Made of cold cast resin infused with bronze powder that gives him the look of metal, with hand painted accents to show off the detail. The bottom is felted to help keep your furniture scratch-free. He makes a great gift for enthusiasts of ancient Egypt mythology. Item Number: UI-WU76733A4 | Approximate Size (Inches): 5.20 wide x 5.50 deep x 10.30 high | Approximate Shipping Weight: 3.00 lbs.